The Online News Association’s annual conference and awards took place in Boston at the end of last week. Here is a round-up of the must-read blog posts which will help you sort though the noise of an event that saw 21,000 tweets sent by around 1,200 journalists. A two-part post by university lecturer Sue Newhook on the top 10 tech trends is one to read and bookmark. It has links to handy tools and news of developing technologies. Part two of the post is here. There is also a must-read Storify created by Craig Kanalley, an editor at the Huffington Post, with 13 key takeaways told in 13 tweets. The 10,000 Words blogs has a series of posts, including on how to find and create an awesome web apps team and be a rockstar data developer, on verifying images and information from social media and this guide explaining how to create visual interactives In news time. The second screen is literally what it sounds like — the screen readers look at in addition to the TV. This could be an iPad, a laptop or a phone. According to [Patrick Stiegman of ESPN] stats about Internet consumers, 85 million Americans consume both TV and the web simultaneously. This provides a huge opportunity for news organisations to serve fans in real time, alongside live events. One particularly interesting area for UK news sites to consider is how the New York Times, which doesn’t control the first screen, competes with eyes for the second screen. 1. Event cycle: What’s happening, how much can I get about the event before it happens? 3. Conversation cycle: What are other people and my social circle saying and how can I chime in? To accomodate for all three cycles of these major events, the best project to point at is The New York Times’ Oscars coverage, which was a dashboard built with three streams. Free Twitter and Facebook widgets for the conversation elements. If you were unable to take a trip to the US to attend #ONA11, you can learn about key developments in journalism at news:rewired – connected journalism, which takes place in London on 6 October. This entry was posted in Editors' pick, Handy tools and technology and tagged #ona11, 10000 Words, New York Times, Online News Association on September 26, 2011 by Sarah Marshall. Google News unveiled a new feature during a session at the Online News Association Conference in Boston at the weekend which will allow publishers to highlight their top content and give “even more credit where credit is due”, according to the Google blog. At present the so-called “standout content” tag is only available on the US edition of Google News and it is not clear from the Google blog when it plans to roll out the new feature in the UK. Standout content tags work best when news publishers recognise not just their own quality content, but also the original journalistic contributions of others when your stories draw from the standout efforts of other publications. Linking out to other sites is well recognised as a best practice on the web, and we believe that citing others’ standout content is important for earning trust as you also promote your own standout work. Google is asking news sites to use the tag a maximum of seven times a week so that it can recognise what is exceptional content. The 10,000 Words blog was at Online News Association Conference and has more on the launch of the feature. This entry was posted in Online Journalism, Search, Traffic and tagged #ona11, 10000 Words, Google blog, Google News, Online News Association on September 26, 2011 by Sarah Marshall. The Online News Association has this week announced the finalists of its Online Journalism Awards for this year. There are more than 100 finalists across 28 categories which produced shortlists. You can see the full list here. The results will be announced at the 2011 ONA Conference and Online Journalism Awards Banquet on 24 September in Boston. This year, ONA introduced changes to acknowledge the explosion of journalistic innovation on new digital platforms. Entries for all awards were open to news produced for any digital device. Eight awards come with a total of $33,000 in prize money, courtesy of the John S. and James L. Knight Foundation and the Gannett Foundation, which also is supporting innovative investigative work with two $2,500 awards. This entry was posted in Awards, Editors' pick and tagged Awards, digital journalism, Online Journalism Awards, Online News Association on September 1, 2011 by Rachel Bartlett. This article was originally published by the European Journalism Centre. It is reposted here with permission. The 2010 conference of the Online News Association (ONA) pushed further the debate on how technology is shaping the future of journalism in the evolving web media landscape. The event was held in Washington DC, the US capital, between the 28-30 October, 2010. Founded in 1999, ONA now has more than 1,600 professional members, both American and international, who are active in the business of gathering, producing and disseminating news through the Internet. Jane McDonnell – Executive Director Online News Association from European Journalism Centre on Vimeo. Since its first edition in 2004, the association’s annual conference has been the premier global arena bringing together highly engaged digital journalists, multimedia producers, content editors, technologists, programmers, designers and newsroom decision-makers from major media markets, independent websites and leading academic institutions. Also this year hundreds of participants converged from all around the world to meet and learn about the latest software and hardware tools for content management, search and distribution platforms, to discuss advancements and challenges in the industry and to network face-to-face in order to share best practices. After the official inauguration on 28 October, the following two days featured an intensive marathon of thematic sessions where prestigious speakers reviewed the current state of art in all aspects of online journalism. Day 1 took off with the latest fashion of technology-driven collaborative journalism: ‘Contents-Sharing through APIs’. This was the title of the panel with Delyn Simons, director of platform strategies at Mashery.com, leading provider of customised platforms through which online media can enable third parties to re-use and present their contents in all kinds of new ways, thus expanding visibility and users. Delyn outlined case-studies of news organisations using Mashery services, such as the New York Times, USA Today and, in particular, the Guardian which has just launched its Open Platform Webfeed. By logging in with a personal API key anybody can access and organise data from the British news daily, and possibly remix them with her/his own data, in order to create original online products for either a personal web platform or the Guardian’s website. The parallel session ‘Rethinking Online Commenting’, moderated by Alicia Shepard, ombudsman at National Public Radio site NPR.org, discussed newsrooms’ policies for users’ engagement. The same topic was covered in a more technical detail at the panel ‘Social Media Storytelling’ where Zach Seward, social media editor at the Wall Street Journal (WSJ), unveiled the secrets for a successful use of Twitter and Facebook when reporting a story. “One of the first steps we take is trying to identify what the potential community or audience is. Usually that is as simple as me asking a reporter about groups and existing communities around his or her subject area”, Zachs says, “Then it’s figuring out how to get in front of and be a part of that community. That’s doesn’t mean you have to have Facebook, Twitter or a Digg account for every project or reporter”. Zachs made the concrete case of the Facebook page created by the WSJ to document a Haitian-American’s mission to rescue his family in Port-au-Prince soon after the earthquake. “Our foreign editor had an idea to tell the story in real time. We thought of the best way to make that happen, and a Facebook page with its status updates seemed to be particularly useful”. Besides enhancing contents distribution, technology can also help improving contents production. One of the most powerful examples is ContentCloud.org, a new open-source semantic-web platform which makes primary source materials easier to scour, annotate and share. At the panel named after his own company, Jeremy Ashkenas, lead developer at DocumentCloud, showcased a number of investigations conducted by news outlets across the US through using DocumentCloud as a workspace where reporters upload documents, share them with their team and do structured searches and analyses based on extracted entities: The people, places, and organizations mentioned in the text of the documents. In-depth journalism was also the theme of the panel ‘The New Investigative Journalism Ecosystem’ where Charles Lewis and Kevin Davies, respectively founder and CEO of the new InvestigativeNewsNetwork (INN) explained how the number of global non-profit reporting organizations (many of them INN members) has exploded, from three in 1990 to more than 30 today, and how they use web tools and platforms to collaborate and make public interest journalism available to an increasing number of online users. But how accurate reporting can survive at a time where journalists can use more and more online sources which are not always reliable? An attempt to answer this challenging question was made by Solana Larsen, managing editor at GlobalVoices, at the panel ‘Tools for Crisis Reporting’. According to Solana, journalists often belong to two opposite and extreme categories: On the one hand, you have those who rely too heavily on social networks without doing any background checks or speaking with real people; on the other hand, you have those who rely on official sources only and don’t look for unreported local voices scattered across the web. GlobalVoices platform intends to fill this gap through helping journalists use alternative sources of information in an appropriate way. How? “Unless you talk to somebody who knows well enough the blogosphere of a given country you cannot understand if what is published on a specific blog is representative of a general trend or not”, Solana says, “GlobalVoices aggregates comments on each issue from all local blogs in order to provide a more accurate and diversified picture”. Day 2 was marked by the panel ‘Ten Tech Trends in ’10’ where Amy Webb, CEO at her own consultancy company Webbmedia Group, highlighted the latest digital tools and their application to online journalism. Let’s start with what is called Geofencing. “Network mobile applications can now literally locate people in a defined space”, Amy says, “That implies a radical change for hyperlocal journalism. Today people go to a website, type a zip code and get local news. Tomorrow, with Geofence, people can run a mobile app which allows their phone to be identified in a given space and receive automatically news updates related to that specific location. Users will no longer follow the news. The news will follow them anywhere they go”. Locating people is also possible through Sensor Technology. “Just put sensors in cloths and coffee cups to keep track of everything people are doing”, Amy says, “There are a lot of opportunities for reporting, but also a lot of privacy concerns. Data can be uploaded on the web where reporters can look for them and use them to write their stories”. Once you have got the information you were looking for, the next step is delivering it to your users according to their specific needs. “Flipboard.com is a dynamic content generation platform which allows users to select twitter feeds, Facebook accounts, and other web sources on their favourite topics and creates automatically paginated online magazines displaying updates on such topics”, Amy says. The last sessions focused on news apps, including those which help make public data available in a more users-friendly way, tools for data visualization and techniques for video-shooting, which completed the hyper-tech-gallery which already included web design and search engines during Day 1. Stefano Valentino is an Italian journalist based in Brussels. Since 2008 he has been operating his own EU online customised information service EuroReporter.eu. In 2008 he founded the no profit association Reporters for an Interactive, Cooperative and Specialzied Information (Ricsi). This entry was posted in Events, Online Journalism and tagged European Journalism Centre, jane mcdonnell, ona, ona conference, Online News Association, open platform, social networking, stefano valentino on November 2, 2010 by Stefano Valentino. Industry group the Online News Association (ONA) has received a $75,000 grant to redesign its website. The funding comes from the Excellence & Ethics in Journalism Foundation (EEJF) and will be used to create an open-source site containing resources and training materials for digital journalists. This entry was posted in Editors' pick, Media releases, Training and tagged ona, Online News Association on September 3, 2010 by Laura Oliver. Over in the US, at a recent Online News Association Washington (ONADC) /Hacks & Hackers meetup, Derek Willis from The New York Times interactive news technology team discussed data, coding and journalism and the Times’ ‘Toxic Waters’ project. This entry was posted in Editors' pick and tagged derek willis, hacks & hackers, ona, Online News Association, toxic waters on May 6, 2010 by Judith Townend. “To what extent does where you run your blog from and / or host it impact its legal situation? asks Sunny Hundal of Pickled Politics, using his own and Guido Fawke’s blog as examples. “The [US-based] Online News Association is surveying digital journalists to gauge the need for low-cost Media Liability Insurance coverage, which includes libel, defamation, copyright and other publishing torts. “If ONA determines enough need and interest, we will work to provide a program tailored for digital journalists under the ONA name. “Please take a few moments to complete the following survey. If you aren’t in need of Media Liability Insurance, please forward this to someone who might be. The survey will close on Friday, October 16. This entry was posted in Editors' pick, Legal, Online Journalism, Social media and blogging and tagged Cyberjournalist, media liability insurance survey, Online News Association, Sunny Hundal on October 14, 2009 by Judith Townend. The US-based Online News Association needs to be more global, writes Alfred Hermida, professor of journalism at the University of British Columbia, before setting off to its annual conference. “One major issue is the dominance of US panelists. While many of these have much to contribute, the ONA is doing its members a disservice by not noting that most of the world’s online news organisations are based outside of the US. It should follow the lead of the recent Future of Journalism conference in Cardiff which brought together ‘scholars from across the world’ he says. This entry was posted in Editors' pick, Events, Training and tagged Alfred Hermida, ona, Online News Association on September 30, 2009 by Judith Townend. ELPAIS.com and Soitu.es claimed the first general excellence awards for non-English language sites at the Online News Association (ONA) 2008 awards on Saturday. “On a bedrock of first-class journalism it has built a brilliant suite of infographics that are rich in information, yet easy to consume,” they added in a press statement. ‘Bearing Witness‘, Reuters multimedia coverage of fallout from the invasion of Iraq in 2003, took the best multimedia feature award in the large sites category, while Adrian Holovaty’s EveryBlock was awarded the prize for outstanding use of digital technology by a small site. This entry was posted in Uncategorized and tagged Adrian Holovaty, Andes, Arizona Daily Star, ArmyTimes.com, ArmyTimes.com General, Awards, Azstarnet.com, Beliefnet.com, Chapel Hill, cnn.com, Dallas Morning News, DallasNews.com, DesMoinesRegister.com, digital technology, Eliot Spitzer, ElPais.com, EveryBlock.com, Fixing D.C. Schools General, General, Globe and Mail, Iowa, Iraq, large site, LasVegasSun.com, LasVegasSun.com General, los Andes, MarkFiore.com, medium site, Middletown, New York, North Carolina, NYTimes.com, Online commentary, Online News Association, OregonLive.com, political cartoons Online commentary, RecordOnline.com, reuters, Reuters.com, Soitu.es General, St. Louis Post-Dispatch, STLtoday.com, Taliban, Taylor Hayden, The Dallas Morning News, The Globe and Mail, The Oregonian, The Times, Universidad de los Andes, University of North Carolina, USA, usatoday.com, washingtonpost.com, WebMD, Western Kentucky University on September 15, 2008 by Laura Oliver. We’re a little bit sad here at Journalism.co.uk towers that we didn’t get to go to either of this week’s major journalism conferences, the Global International Journalism Conference (GIJC) in Lillehammer, Norway and the Online News Association (ONA) in Washington DC. But we got our web feelers out and collated these Twitters for your perusal. Over at the ONA Twitter Search you can follow the Poynter Group, who are all twittering madly (you’ll need to create yourself an account to log in) and you can see the tweets from the first session of the morning here. The ONA has put together information about the Twitterers, discussion groups and podcasts here. 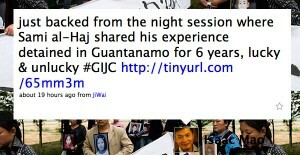 Meanwhile over GIJC Twitterland we picked up this Tweet about Al Jazeera’s Sami al-Hajj – imprisoned in Guantanamo Bay for six years. We’ll be back with a better summary of the conferences’ outcomes next week, when we’ve spoken to a few more participants. This entry was posted in Online Journalism and tagged conference, Guantanamo bay, Journalism, Journalism.co.uk, Journalism.co.uk towers, Lillehammer, Norway, Online News Association, Pat Thornton, Po, Poynter Group, Sami Al-Hajj, Tweet, Washington DC, web feelers on September 12, 2008 by Judith Townend.